TeMeCo and its partner GrafiMedics will exhibit again during the NHV Congres in 2019./ The NHV Congres will take place in Amersfoort on 16 March 2019. 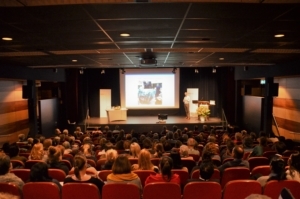 The NHV Congres is the meeting place for people who work in cardiology in Dutch hospitals. About 200 participants visited the exhibition and many have visited the booth of GrafiMedics/TeMeCo to review the SenseLink and its benefits. We are pleased to announce that TeMeCo has extended the collaboration with GrafiMedics and closed a distribution agreement with the Belgium branch of GrafiMedics. The expansion includes the representation of SenseLink in Belgium and Luxemburg. With this new agreement, the product is offered more broadly in the medical market. With the representation of SenseLink, GrafiMedics Belgium has extended it’s portfolio and now also offers the SenseLink to its customers. The collaboration focusses on distributing the SenseLink to hospitals in Belgium and Luxemburg. GrafiMedics Belgium is a well-known and leading organization in the supply of high-quality medical products, services and solutions. All business activities are operated from the office in Nazareth. The company represents also the products of Philips Healthcare. Mid November 2018, TeMeCo started together with GrafiMedics with an innovative project at Albert Schweitzer hospital in Dordrecht. In the project, SenseLink is used to perform 72-hour ECG registrations in the home environment. The departments of neurology and cardiology are involved for performing the measurements and analysis. The goal of this project is to detect atrial fibrillation at TIA patients. Until 2018 these measurements were done within the hospital because guidelines prescribed a screening of 24 hours. However, new guidelines prescribe that this should be done for 72 hours. By using the SenseLink it is possible to monitor the patients in their home environment during their daily activities with a minimal load. Furthermore, the detection of atrial fibrillation is expected to be more effective while gathering ECG data of a longer period of time. With this project, the Albert Schweitzer hospital is the first Dutch hospital that monitors its (potential) TIA patients in their home environment. A unique project and a clear example of sensible care! We are pleased to announce that TeMeCo has closed an agreement with GrafiMedics for the representation of SenseLink in The Netherlands. GrafiMedics is a well-known and leading organization in the supply of high-quality medical products, services and solutions. All business activities are operated from the offices in Zeewolde (The Netherlands) and Vilvoorde (Belgium). The company represents the products of Philips Healthcare, Quickels, Strässle, Lode and Ergoline. With the representation of SenseLink, GrafiMedics has extended it’s portfolio with an innovative event/holter recorder. The SenseLink is suitable for full disclosure registrations up to 30 days. The collaboration is focussed on distributing the SenseLink to hospitals in the The Netherlands and to take the next step in remote patient monitoring. The noise free ECG registration ensures a suitable detection of events, for instance atrial fibrillation in case of suspected TIA. Praxisdienst and TeMeCo hereby present their partnership for the distribution of SenseLink within Europe. For more than 65 years, the Praxisdienst has been a service provider for medical practices. Founded as one of the first mail order companies for medical devices, the Praxisdienst has developed into an internationally successful supplier for the human, dental and veterinary sectors. The main clients are private doctors, hospitals, alternative practitioners, physiotherapists and rescue services as well as sports clubs and production companies throughout Europe. The Praxisdienst, located in Longuich in Germany, has an excellent logistics system and a high service orientation. These elements proved to be the basis for a decent collaboration for SenseLink. Customers of Praxisdienst can order SenseLink in the webshop and get it delivered within a few business days. With the representation of SenseLink, the Praxisdienst offers an innovative ECG recorder to its customers and shows that it continuously focusses on the distribution of new products. TeMeCo and its partner GrafiMedics will exhibit during the NHV Congres in Ede on 17 March 2018. 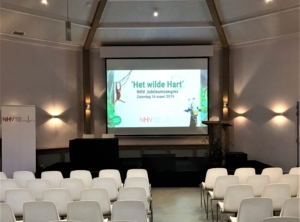 The NHV Congres is the meeting place for people who work in cardiology in Dutch hospitals. About 200 participants visited the exhibition and many have visited the booth of GrafiMedics/TeMeCo to review the SenseLink and its benefits.